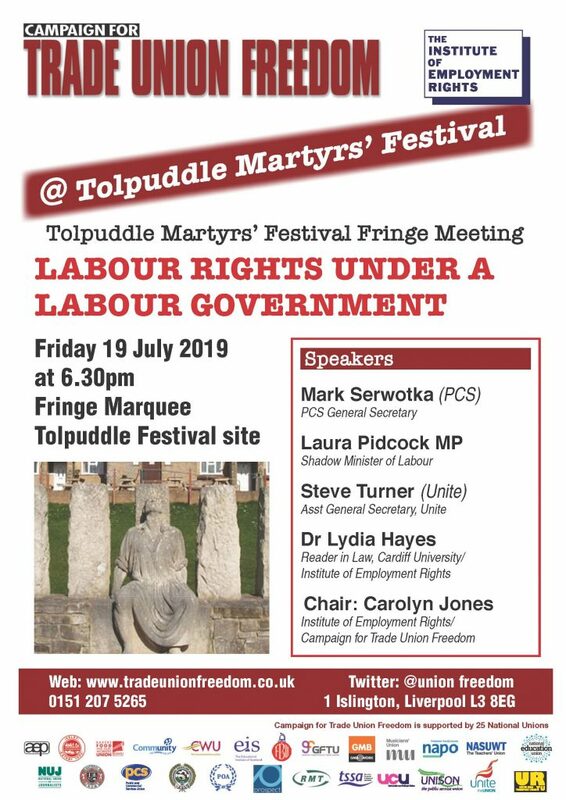 The Campaign For Trade Union Freedom was established in 2013 following a merger of the Liaison Committee For The Defence Of Trade Unions and the United Campaign To Repeal The Anti Trade Union Laws. The CTUF is a campaigning organisation fighting to defend and enhance trade unionism, oppose all anti-union laws as well as promoting and defending collective bargaining across UK, Europe and the World. Napoleón Gómez Urrutia, President of Mexico’s biggest trade union Los Mineros (the mining, metals and manufacturing union) who is also a Senator in the new left lead Mexican Government has called on Mexico’s independent trade unions and labour organisations to join in a new movement – the International Workers Confederation (IWC). He called on labour organizations to build on the momentum that the country is experiencing in order to consolidate the rights and gains of trade unions, increase wages and make union democracy a reality, emphasising that it is time to pay the historic debt owed to the working class. Gómez Urrutia stressed that unions must also internationalise and globalize to defend together the rights of workers in every country and gain greater strength and unity to confront the bosses, and respect for the rights of workers who produce their wealth but are poorly compensated. Los Mineros is a now member of the global union Workers Uniting with Unite in the UK and Ireland and the United Steelworkers in the USA and Canada. 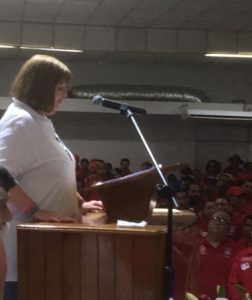 Unite’s vice chair Jayne Taylor addressed thousands of Los Mineros and United Steelworkers members at the assembly welcoming them into the Workers Uniting family and pledging solidarity and support for Mexican workers fighting against ayellow unions and anti union global corporations exploiting Mexican workers. 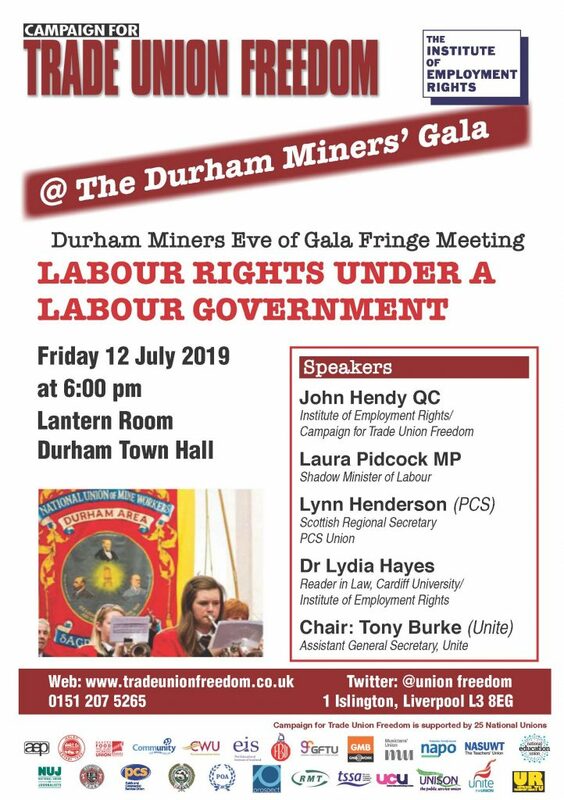 CTUF – IER At Durham Miners – Eve Of Gala Rally. US senator Bernie Sanders, who says he intends to run the first ‘unionised presidential campaign in history’, has announced that if elected he will enact legislation to ban the USA’s right to work laws. “When billionaires like the Koch brothers spend millions of dollars successfully lobbying for so-called ‘right to work’ for less laws, they are waging a war on workers,” the Vermont senator said in a speech to the International Association of Machinists union. Just more than half of U.S. states currently have some form of law banning unionised workplaces from negotiating contracts which require all members who benefit from a union contract from paying dues. Based upon the 1947 Taft-Hartley Act, such laws can now be found in 28 states and in Guam, and they have spread with heavy lobbying from the U.S. Chamber of Commerce and prominent Republican donors such as the billionaires Koch brothers. 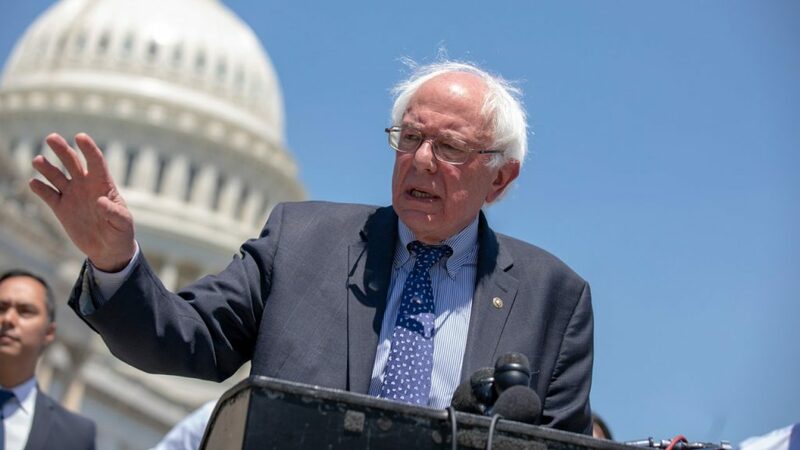 “When we are in the White House, we are going to pass the Workplace Democracy Act that I will be re-introducing in the Senate,” Sanders told the union. In a huge blow to unions last year last year, a sharply divided Supreme Court ruled in the case of Janus v. AFSCME that government-employee unions could not force non-member workers to pay bargaining fees – thus enshrining a ‘freeloaders charter’. The mandatory fees banned by the Janus decision had been in place for more than forty years under the 1977 Supreme Court precedent Abood v. Detroit Board of Education, Justice Samuel Alitoruled was as a violation of the First Amendment – the right of association. “It was meant not to undermine but to protect democratic governance – including over the role of public-sector unions,” she wrote at the time. 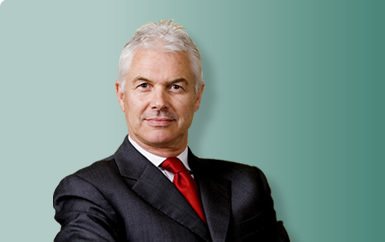 In reply to Kevan Nelson’s letter in the Star on 26th February, no-one is advocating that the judgments of the EU court which are adverse to workers’ and trade union rights should be preserved to inhibit the incoming Labour Government. There are a good number of such adverse decisions. But there are some judgments which fortify workers’ rights. was clear that we meant that there should be a legal requirement that workers’ and trade union rights in the UK after Brexit should be no less favourable than those applicable in the EU. Under a Labour government, it goes without saying that workers’ and trade union rights in the UK will be more favourable than those in the EU and that we will be freed of CJEU decisions such as Alemo-Herron, Viking and Laval. The guarantee shall be enforced by the UK courts on the application of any worker in the UK claiming to be affected. The guarantee shall be written into the Treaty for leaving the EU. 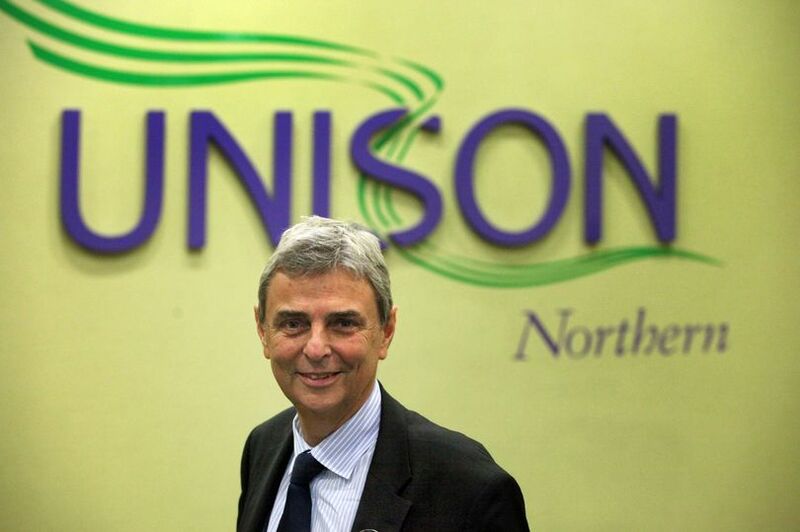 Commenting on the government’s announcement about workers’ rights, UNISON general secretary Dave Prentis said: “Any guarantees about protecting existing and ensuring future employment rights must be in the Prime Minister’s withdrawal agreement. “Anything less, and the promises aren’t worth the paper they’re written on. “European laws have made working in the UK safer and better. Brexit mustn’t mean UK employees become the cheapest to hire and the easiest to fire. GMB, Britain’s general union, has responded to the Government’s ‘meaningless’ workers’ rights assurances. Tim Roache, GMB General Secretary, said: “No one should be under any illusion – support for the Prime Minister’s bad Brexit deal means swapping strong legal protections on workers’ rights for legally unenforceable tweaks that are not worth the paper they are written on. “As a trade union we know that assurances on ‘non-regression’ are meaningless if there is no way to enforce them. These promises would fail to ensure working people’s rights in the UK keep pace with those in our neighbouring countries. “The crux of this announcement seems to be that Parliament can make new laws if it wants – it can already do that, that’s not a headline, and Ministers on the Government benches have been more interested in removing worker’s rights than protecting them. “The Government’s deal would see the existing backstop on workers’ rights pulled from beneath people’s feet, with employment protections we all rely on being left to the mercy of whichever hard line Tory takes the reins next. 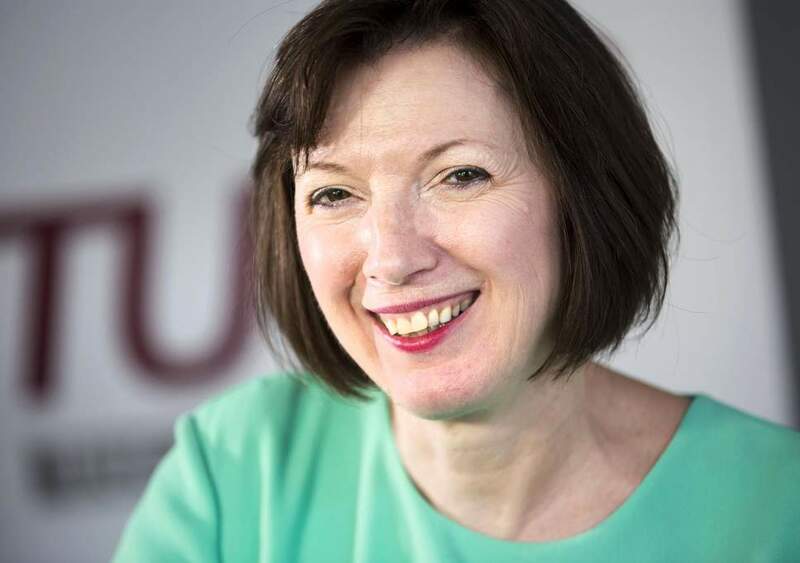 Government proposals to protect workers’ rights after the UK leaves the European Union will do little to stop the mistreatment of workers at the hands of ‘greedy bosses’, the leader of Britain and Ireland’s largest union, Unite said today (Wednesday 6 March). 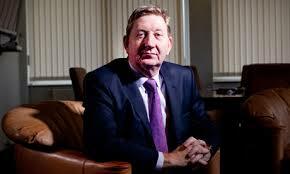 Responding to the government’s plans, Unite general secretary Len McCluskey said: “After all the talk and media briefing preceding this announcement, it is deeply disappointing that the government appears not to have listened to any of the concerns expressed by trade unions. “Workers needed assurances but unfortunately all that is on offer is reheated leftover announcements. The mistreatment of workers at the hands of greedy bosses is set to continue. “The prime minister has made a mockery of her own claim that Britain is leading the way on workers’ rights. ”These are flimsy procedural tweaks. They come nowhere close to ensuring existing rights are protected. And they won’t stop workers’ rights in the UK from falling behind those in the rest of Europe. “What’s more, there’s nothing to stop a future right-wing government tearing up this legislation altogether. 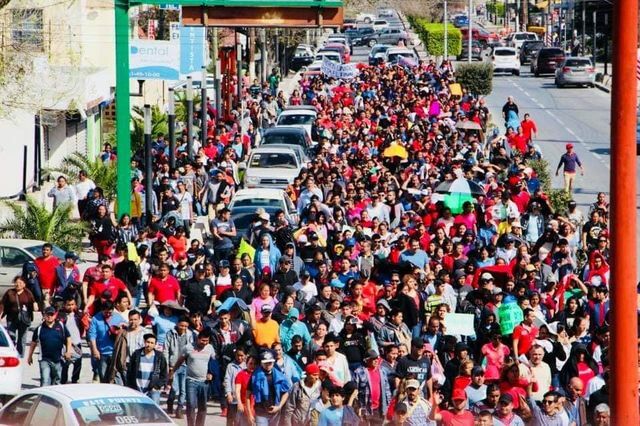 At 2 p.m. Friday, 30,000 workers in 41 factories represented by the Union of Laborers and Industrial Workers of the Maquiladora Industry (SJOIIM) in Matamoros went on strike. The workers are demanding a wage increase of 20% and åa bonus of 32,000 ($1600) which is roughly equivalent to the 100% minimum wage increase implemented by the federal government. Many of the union contracts have language that requires any increase in the minimum wage to be applied to the entire pay scale (not just those at the bottom). The contracts also contain a daily productivity bonus which was negotiated in 2015 in place of a wage increase. The union rejected an offer of 10% and 10,000 pesos ($500) on Thursday. One group of workers is being supported by Los Mineros, who represent two plants in Matamoros. 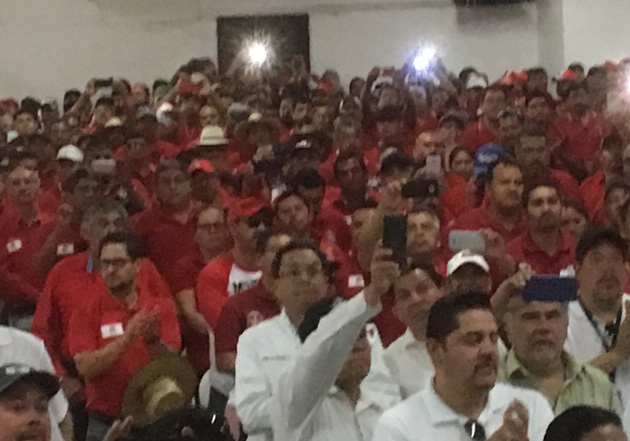 A video of a meeting between Javier Zuñiga, the Mineros representative in Matamoros, and the the CTM union leader, Juan Villafuerte, shows the pressure by workers on the CTM union to reject the employers’ demands. Another group is being advised by Susana Prieto, a labor lawyer from Ciudad Juárez. The Tamaulipas Labor Board ruled that it had no jurisdiction over 13 companies that produce for the automotive industry, which is subject to federal labor jurisdiction (Trico Componentes, Electromicanicos Bac, Olson Internacional, Key Safety Systems de México, Key Automotive Accesories, Inteva México, Dura de México, Decofinmex, Candados Universales de México, Autoliv México East, Auto Industrial de Partes, ATD de México and Aptiv Contract Services de México). The other 32 plants are under state jurisdiction. Federal Labor Secretary Luisa Alcalde made a public request for dialogue, and the Federal Under-Secretary of Labor, Alfredo Dominguez, is now involved in the discussions. 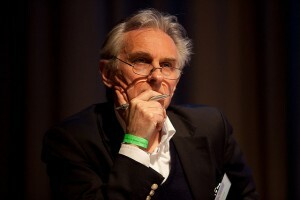 On Friday morning the union rejected his request for a 10 day extension of the negotiations. So far at least 13 companies (NP México, A.F.X Industries, Puertas y Vidrios de Matamoros, Core Composites I & II, CTS Electro de Matamoros, Polytech Netting Industries, Inteva México I, II & III, Tidi, Fypon, Edemsa, Stillman, Dura, and Autoliv) have accepted the union demands. Others have threatened to close down, and local media have reported that Albea Cepillos, Keafford, and Signal Processing have announced that they will close. Media report that in some plants (Trico, Inteva, Albea Cepillos de Matamoros, ATD) management ordered security guards to block the doors to prevent workers from leaving at the end of their shift. At Parker Hannifin and Candados Universales, workers blocked attempts by management to remove machinery, and groups of workers formed outside other factories to prevent any similar attempts. "We raise the watchword, liberty. We will, we will, we will be free!"